Having a hard time finding a special gift for that impossible-to-shop-for book fanatic in your life? We have a unique gift idea for you—one that celebrates your loved one’s love of reading and nurtures that love in others! 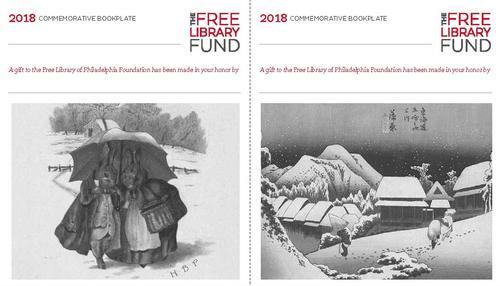 Each holiday season, the Free Library of Philadelphia Foundation creates festive commemorative bookplates for members of the community to dedicate in honor or memory of their favorite bookworm. For a gift of just $50, a bookplate inscribed with your loved one’s name will be placed inside a new book in the Free Library’s collection. This year’s holiday bookplates feature images reproduced from original works housed in the collections of the Free Library’s Print and Picture and Rare Book departments. One showcases a stunning 1830s-era woodcut from Japanese artist Utagawa Hiroshige titled Night Snow; the other features the charming watercolor A Happy Pair by the beloved children’s illustrator Beatrix Potter. To order this unique and meaningful holiday gift, just fill out this simple form! Like all the best gifts, a Free Library bookplate keeps giving. When you dedicate a bookplate you aren’t just buying a gift for one individual—you’ll have an ongoing positive impact on the lives of tens of thousands of people across the region. How is that possible? The Free Library welcomes more than 10 million visits each year—five million in-person, five million online. By making a gift and dedicating a bookplate, you’re playing an essential part in the public-private-partnership that sustains the Free Library’s 54 locations within walking distance of all Philadelphians; allows the Library to develop and present programs, services, and resources that meet the interests and needs of people of all ages and backgrounds; and—most pertinently here—maintains and builds excellent, comprehensive, up-to-date collections. How does the Free Library’s public-private partnership work? Public support from the City of Philadelphia provides for the Library's facilities and infrastructure, but the Library’s many critical offerings that draw people into our neighborhood libraries and foster literacy using its essential holdings depend on private gifts from people like you. Think of dedicating a Free Library bookplate as giving the gift of literacy to your fellow Philadelphians. What a thoughtful, lovely, and important thing to do! Through your generosity to the Free Library Fund, our city’s youngest minds will have greater access to STEM (science, technology, engineering, and math) activities during out-of-school time. Curiosity seekers will have world-class special collections at their fingertips. Some of our newest neighbors will find a taste of home in the Culinary Literacy Center. And job seekers and entrepreneurs will continue to build their networks through the Free Library’s career-literacy workshops and resources. Give a gift from the heart that’s also one for the books this holiday season. Dedicate a Free Library commemorative holiday bookplate today and ensure that the gift of literacy is spread throughout our beloved city. For a gift of just $50, a bookplate inscribed with your loved one’s name will be placed inside a new book in the Free Library’s collection. What a lovely gift idea for the holidays! Add a Comment to Give a Gift from the Heart: Dedicate a Bookplate at the Free Library!